Girl Sees Art presents PAPER DOLLS, a pop up solo show featuring one year of Karen Fisher’s daily fashion-inspired collage works. Timed in conjunction with New York Fashion Week, the show treats magazine cutouts and textile-like everyday materials to the same reverence and creative influences as their runway counterparts. Initially conceived as a simple daily warm up for her studio practice, mixed media artist Karen Fisher’s vibrant colleges have quickly become integral to her work. Each day in 2016 (a leap year), Fisher took one hour to compose an 11x14” image derived principally from fashion magazines. Each month, her social media audience picked their favorite collage, which she then interpreted into a mixed media painting. The results, presented in chronological order, are 366 small colleges and 12 large paintings, each featuring an amalgamation of faces, body parts, textile designs, animals, plants, and text. Drawn to fashion photography and its ability to gesticulate a moment in time, Fisher takes these sublime figures, dismembers and reconfigures them, resulting in a fresh form at once familiar and strange, reborn in the context of the diverse influences prevalent in her daily life. Whereas her daily collages strictly feature imagery from a single magazine, her expanded versions on canvas use source material more liberally, combining magazine imagery with paint and found materials such as doilies, champagne foil, and napkins. In combining high fashion imagery with the utility of everyday objects, Fisher takes a democratic stance towards popular culture, one in which all mediums are held in equal esteem. In this way, her work recalls the show’s title, Paper Dolls - something simultaneously common and refined, the import of which is defined by the imaginative associations we bring into play upon engaging it. Both figurative and abstracted, distorted and impressionistic, and frankly opulent in its use of color, pattern, and texture, Fisher’s work speaks to the beauty inherent in the eclectic. 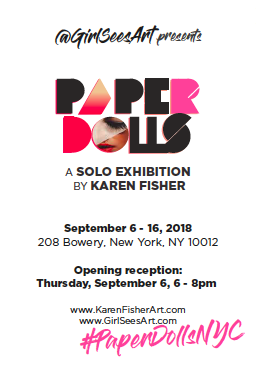 PAPER DOLLS (#PaperDollsNYC) opens September 6th from 6-8pm and will offer branded tote bags to the first 100 guests. All works will be available for purchase opening night as well as online after opening night until the show’s closing on Sept 16th. For more information, visit girlseesart.com. Since leaving her 15 year teaching career behind in 2012, Karen Fisher has focused on her multimedia practice in Denver, CO and Dayton, OH, showing and selling her work naVon-wide. A lover of figuration, her work is often imbued with images culled from the fashion world. With a master’s degree in Contemporary Art Marketing from the Fashion Institute of Technology, Beckie Warren provides the public with intimate access to the art world from a knowledgeable insider through her popular art Instagram blog, @GirlSeesArt, founded in 2015. Both an influencer and curator, Beckie is passionate about sharing artwork from and giving a voice to emerging artists.